Pisang Peak (6,091 m) sometimes known as ‘Jong Ri’ is one of the most popular trekking peaks falling in Annapurna Circuit. This peak is named after a village in Manag District. It is on the way to the highest pass of the world and offers good scope for exploration. The western flank of the mountain is guarded by a hanging glacier and offers considerable challenge. This trekking peak offers some of the rarest fantabulous panoramic view of Manang Valley along with Annapurna group including Tilicho Peak, Annapurna II and IV, Ghangapurna and the Glacier Dome. First conquered by a German Expedition team in 1955; Pisang Peak seeks more technical knowhow of as it goes through a highest pass of the world, Thorong La Pass. Arrival at Tribhuvan International Airport in Kathmandu and transfer you to your hotel by private vehicle. Chamje Trek to Dharapani (1,960m/6,430ft), 5-6 hrs trekkings. Upper Pisang to Manang Valley (3,500m/11,482ft), 4-5 hrs trekking. Throng Phedi Trek to Throng La (5,416m/17,765 ft) to Muktinath (3,800/12,467ft), 7-8 hrs trekking. * KTM International Airport Arrival & Departure Transfer by Private Comfortable Car/van/ Hiace. * 3 Nights Accommodations on B/B Plan Twin Sharing in Kathmandu at standard hotel. * Round Trip( Jomsom to Pokhara ) Flight fare for Guests & Guide with all taxes. * English Speaking experienced Sherpa Govt. 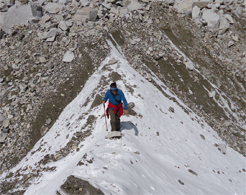 Trained/Licensed Holder Guide for whole Trek & island Peak climbing guide. * Porter (1 porter Between 2 Person basis, Max 30 KGS per Porter) for Whole Trek guide. * Full Board basis Meals (Breakfast, Lunch & Dinner With tea/coffe ) as per above Itinerary. * Insurance, Daily Wages, Equipments and all meals & Lodges of Porters and Guide in Whole Trek. * Sightseeing in Kathmandu City (Swayambu nath, Buddha nath Stupa, Kumari temple/durbar square & paten durbar squrae by tour guide and car/driver( 5-6 hrs tour). * Necessary fixed and dynamic ropes and kitchen crew/First Aid kit). * NMA Climbing permit for Pisang peak and Trekking Permit and TIMS card will be provided. * Equipments Charge of Climbing Sherpa. * Garbage Clearance Deposit to NMA( we will pay our self for this Deposit). * Government taxes & Other Applicable Fees.